John Weber, who was born on June 12, 1884 in Beideck, Saratov, Russia, married Elizabeth Klaus who was born on September 29, 1884 in Norka, Saratov, Russia. They met in Portland, Oregon and were married on July 11, 1908. But they took very different routes to Portland: grandmother Elizabeth traveled with her mother Anna Maria (Emma) Giebelhaus Krieger Klaus (1844-1931) and brother Adam Klaus (1874-1927) and his family, leaving Russia on June 13, 1906. They sailed on the steamship Canada from Liverpool, England to Montreal, Canada and arrived in Portland, Oregon July 25, 1906. Grandfather John traveled with his parents, Heinrich C. Weber (1859-1911) and Elizabeth Georg Weber (1862-1927), along with brothers Heinrich Weber (1882-1906), Lucas Weber (1889-1964) and sister Elizabeth Weber (1897-1987). They sailed on the steamship Laurentian from Liverpool, England to Portland, Maine on December 24, 1899. The family settled in Campbell, Nebraska where Marie Weber (1901-1962) was born. But after young Henry died in 1906, the family left for Canada - all except John who instead traveled to Portland, Oregon. 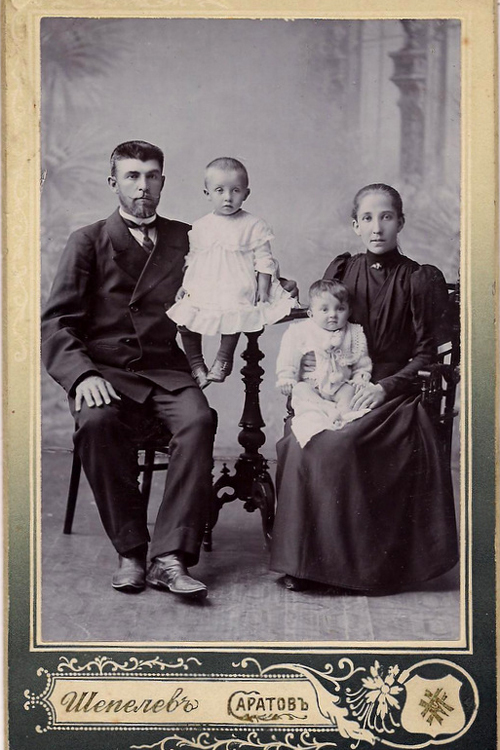 Heinrich C. Weber (born in Beideck in 1859; died in Saskatchewan, Canada in 1911) and Elizabeth Georg Weber (born in 1862 in Beideck, died in 1927 in Portland, Oregon) pictured with son Heinrich Weber (1882 born in Beideck and died in Nebraska in 1906) and son Johannes Weber (1884 born in Beideck; died in Portland, Oregon in 1948). This John is the husband of Elizabeth Klaus (1884-1976). Courtesy of Karen Drier Esayian. 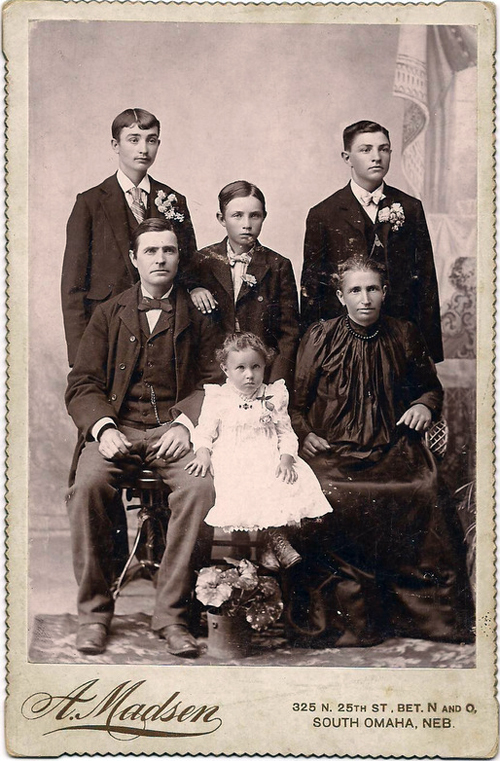 The Heinrich and Elizabeth Weber family, with children: Heinrich 1882-1906; Johannes 1884-1948; Lucas born in 1889 in Beideck and died in Portland in 1964; Elizabeth born in 1897 in Beideck (married Hans Madsen) and died in Portland 1987. Courtesy of Karen Drier Esayian. John Weber (1884-1948) is seated in the lower right. The other men are believed to be William Hohnstein, John Holm and George Schnell (standing on the right). Courtesy of Karen Drier Esayian. Great great grandfather Georg Peter Weber (1832-before 1910) also immigrated on December 24, 1899, traveling with his son Heinrich and family. Two other sons: George P. Weber (1857-1941) and Johann Weber (1876-1963) had immigrated in February of 1892 on the steamship Saale. Great great grandfather Georg Peter settled with son George P. who was living in Colorado. 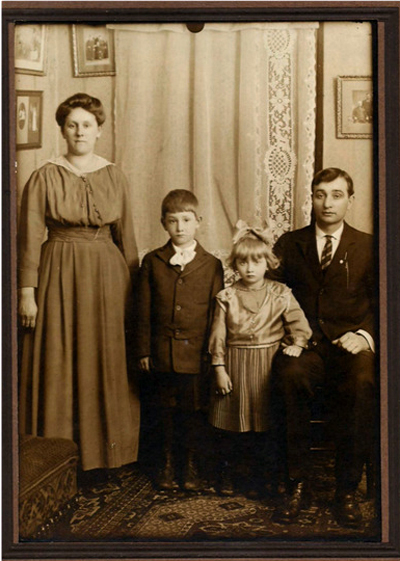 By early 1908, great grandfather Henry, with his wife Elizabeth and children Lucas, Elizabeth and Marie left Nebraska and headed to Saskatchewan with the intent of Homesteading. (The Lutheran Colonization Co. had worked with the Luse Land Co. to acquire Homesteads for members of the German Lutheran Church in the United States.) In Homestead paperwork, it is stated that Henry and his family commenced actual residence on the Grosswerder, Saskatchewan property April 19, 1908 and had a house built by September of 1908. On April 18, 1911 the claim for Patent for the Homestead was signed by Heinrich Weber in Macklin, Saskatchewan, Canada. Sadly, this is also the registered date of death for great grandfather Heinrich. Elizabeth Klaus Weber (1884-1976) and John Weber (1884-1948) with their children Harold (1906-1980) and Leona (1912-1983) at their home on Rodney Avenue in Portland, Oregon. Courtesy of Karen Drier Esayian. After Heinrich's death in Saskatchewan, great grandmother Elizabeth along with Lucas, Elizabeth and Marie all eventually settled in Portland, Oregon. They joined grandfather John and his wife Elizabeth and their growing family: Harold Raymond (1909-1980), Leona (1912-1983), Arthur Henry (1919-1996) and Kenneth Carl (1923-1924). (A twin to Arthur had died at birth in 1919). John and Elizabeth's first home was at 766 Rodney Avenue; later they moved to 3817 Mallory Avenue. Portrait of Heinrich (1859-1911) and Elizabeth (1862-1927) Weber taken in Alberta, Canada. Courtesy of Karen Drier Esayian. 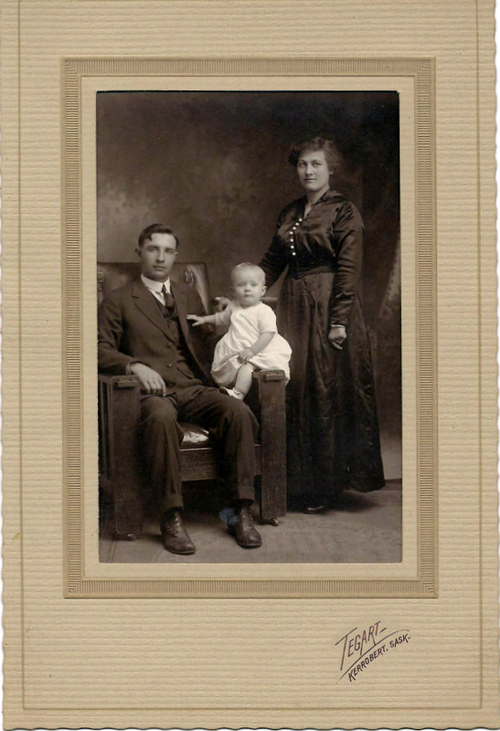 Lucas Weber (1889-1964) and Elizabeth Hinkle (born in 1889 in Norka and died in in 1976 in Portland, Oregon) with son Frank Lucas Weber (1916-2002) Photo taken in Saskatchewan. Courtesy of Karen Drier Esayian. Grandfather John was a streetcar motorman in Portland, and had also bought horses and a truck for carrying freight. Later, he worked for the Oregon Casket Company in the shipping department. Grandpa readily adapted to working in an English speaking country and grandma also had a good command of the written and spoken language, even though Volga German was primarily spoken at home. Grandma Elizabeth's life revolved around her family, home and the church. I treasure the many woolen quilts she handcrafted, along with cotton ones for summer. Both of them were committed to the building of the Zion German Congregational Church at NE 9th and Fremont; grandfather served as the Treasurer. They were also committed to the Volga Relief Society organized in 1921. The first Weber to emigrate to Russia was Nikolaus Weber (born 1739 - died before 1798) and his wife Anna Maria; they came from Loewenstein, Germany. The first Klaus to emigrate to Russia was Johann Peter Clauss (1727-1780) and his wife Anna Elisabetta Scheid; they were from Dudelsheim, Germany. The first Giebelhaus (my grandmother's maternal side) to emigrate to Russia was Johannes Giebelhaus (1724-before 1798); they came from Isenburg, Germany. 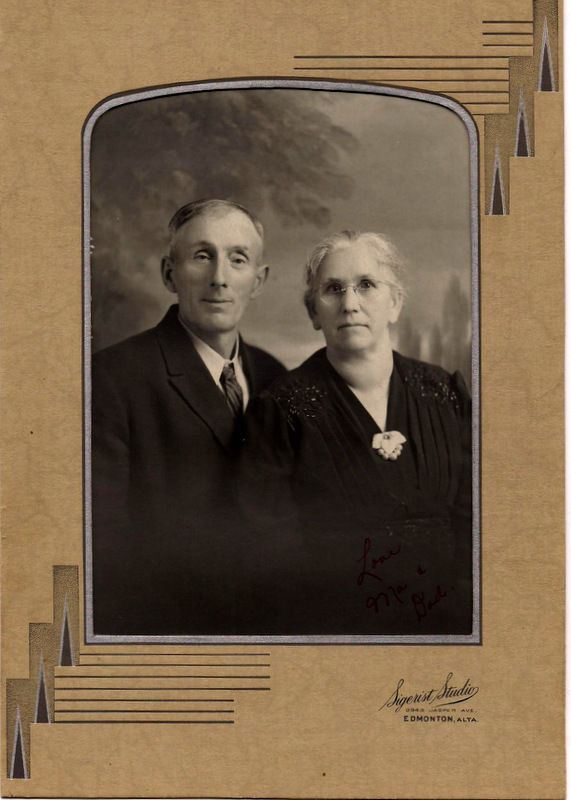 Had it not been for a conversation many years later with great aunt Elizabeth, I would have not known about great grandfather taking his family and Homesteading in Saskatchewan. Even with that knowledge, it took many months to track down the Homestead papers and even longer to find his grave site in Luseland, Saskatchewan. Great grandmother Elizabeth, grandfather John and grandmother Elizabeth are all buried at Rose City Cemetery. 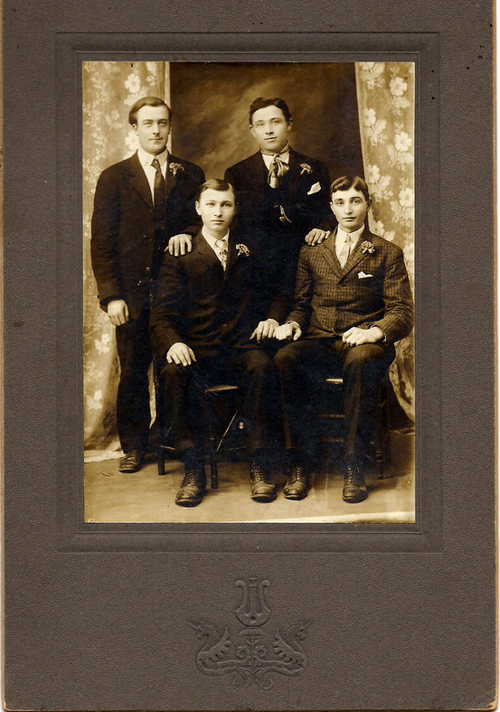 Photographs and story provided courtesy of Karen Drier Esayian, granddaughter of John Weber.